In 2002, prehistoric pile dwellings were discovered on the shores of Lake Degersee, north of the town of Kressbronn / Lake Constance. 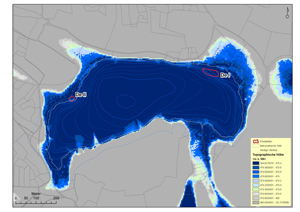 This report presents results of underwater archaeological investigations, which UwArc carried out as a contractor of the Landesamt für Denkmalpflege Baden-Württemberg between 2008 and 2010. Archaeological and natural scientific research was co-funded by the Deutsche Forschungsgemeinschaft. DeI, DeII at the northern shore of Degersee lake. The Degersee, together with the adjacent Schleinsee and some other small bodies of water, is situated in a hilly drumlin landscape south of the river bend of the mouth of the Argen. The sites DeI and DeII are permanently submerged and located near the north shore in about 1.5 – 4m of water. Underwater archaeological field work, which was carried out by teams of three to six scientific divers, took 21 weeks, focusing on DeI. Investigations consisted of borings (47), documentation of lake bed surfaces (487 m²) and excavation trenches (42 m²). About ¼ of the area of the pilefield were investigated. Diving surveys were carried out in the surroundings of the two sites. 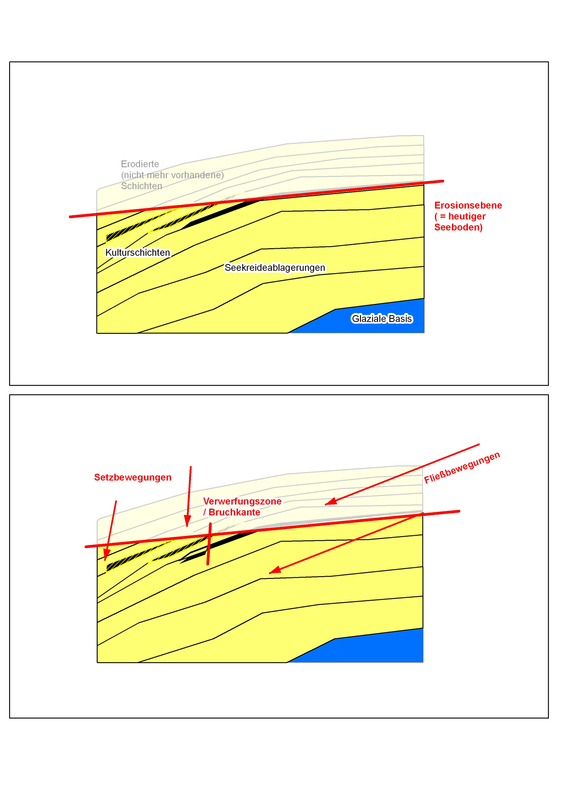 Overview on investigation areaes, excavation trenches (in red), and profiles. 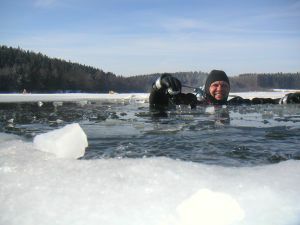 Archaeological diver at work in Degersee Lake. Due to safety and visibiliy reasons, most of the underwater activity was conducted in winter time below Ice sheets. Both DeI and DeII are situated at a silt bank formed in the holocene, on top of moraine promontories of glacial origin. At DeI we documented three organic culture layers (KS1, KS2, KS3) embedded in chalk silt strata, which slope slightly to the south. The periodic change of organic, anthropogenic layers to chalk layers of aquatic origin, and the consistency of all sediments signal fluctuating water levels and the influence of water during sedimentation. Profiles of excavation trenches show that erosive processes have cut and destroyed the prehistoric layers in the more elevated areas rising to today’s shore. According to stratigraphic observations, layer compressions and soil movements have also to be taken in account. At DeII a culture layer was discovered as well. According to these observations, we are dealing with the ruins of villages built on top of a result of lowered water levels. Model of the holocene lake, based on today´s mximum elevation of silt layers. DeI and DeII are situated on former peninsuae. 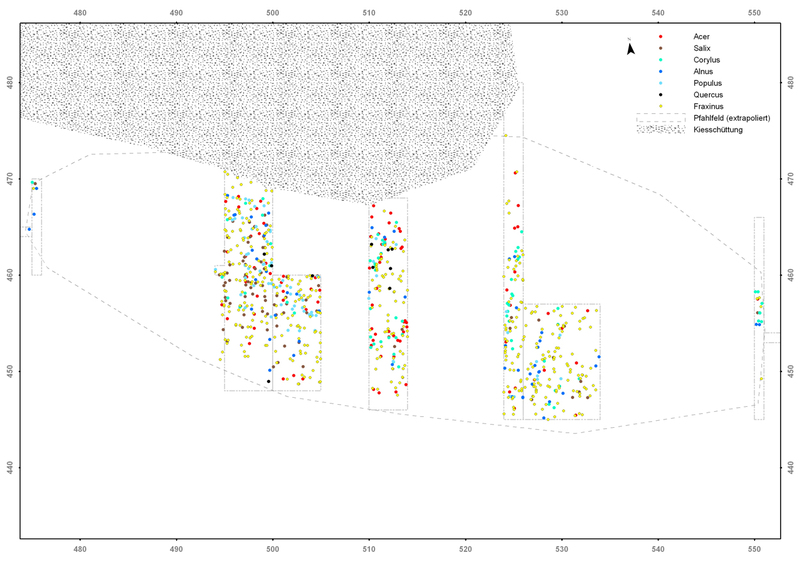 At the DeI site the three culture layers correspond with four events of occupation proved by absolute dating. DeI KS1 correlates to phase DeI A and dates to the 40thcentury BC. The second culture layer contains materials of DeI B, which represents an occupation of the 38th century. In deeper water the deposition contains typologically the same materials, but also younger elements. Botanical evidence proves that the sedimentation at this location lasted until the beginning of Final Neolithic. 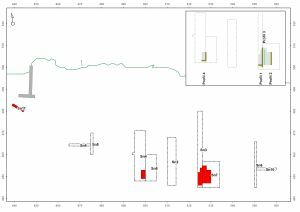 The respective layer was named DeI KS2a and correlates to the occupation event DeI C. DeI KS3 corresponds to DeI D, which dates to the 30th century BC. 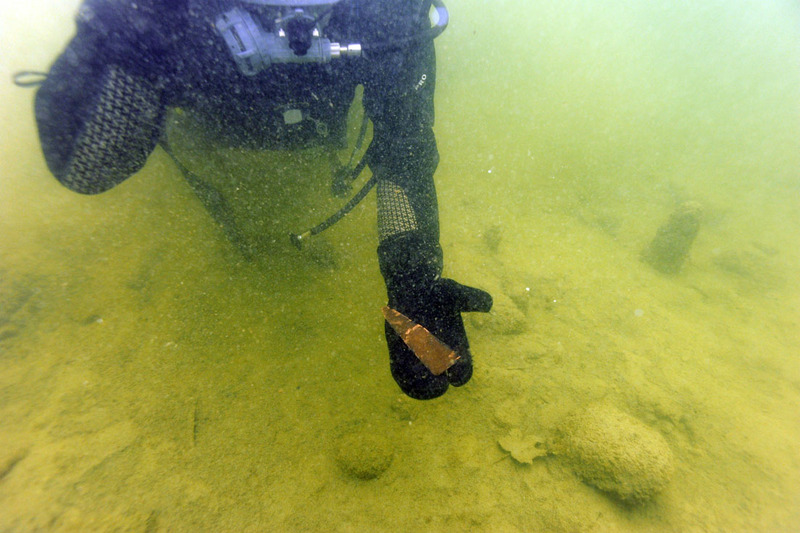 The sequence ends with an Early Bronze Age logboat that was found at the edge of the DeI pile field and was already excavated in 2007. The object can be understood as indication of one other occupation (DeI E). DeII dates, according to preliminary evidence, to about the same time as DeI C in the beginning of the Final Neolithic period. At DeI, 2714 find units (252.5kg) and at DeII, 199 find units were excavated. At both sites objects that are stratigraphically connected to culture layers are supplemented by unstratified objects. Main object-groups are sherds, stone and flint artefacts, animal bones and antler objects. Additionally, wooden artefacts and textiles occur. DeI KS1 (DeI A) contains jars ornamented in the Schussenried way, and bottle-formed ceramic vessels that are similar to those of the Hornstaader Gruppe in the western Lake Constance area. Two unstratified objects, ornamented in Lutzengüetle graffito manner, are to be added here. A sherd of younger Linear Pottery seems to have been brought to the site accidently together with house building materials. 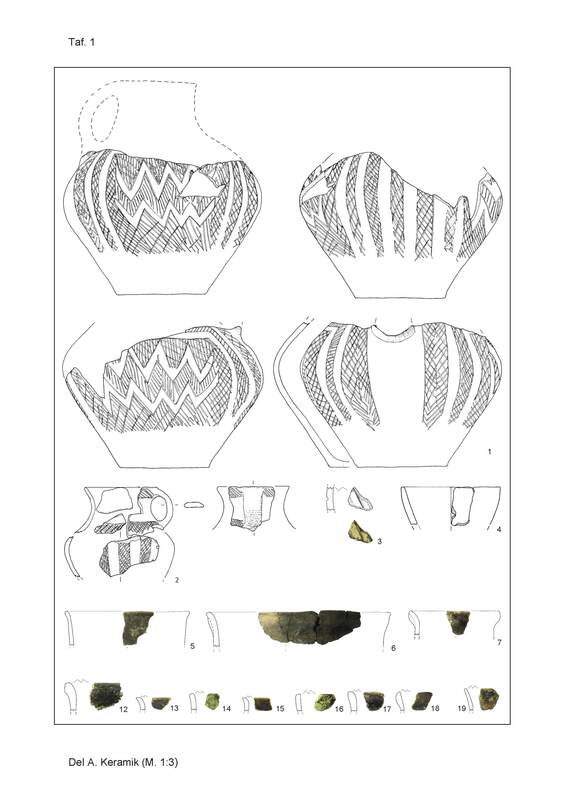 DeI culture layer 2 (DeI B) contains ceramics that can be compared with materials of the Mittlere Pfyner Kultur of the western Lake Constance area and those of the Pfyn-Altheimer Gruppe of Upper Swabia. Apart from some radiocarbon dated piles no objects can be connected to DeI C. DeI D is to be linked to some unstratified ceramic and stone objects, namely a number of “Edelserpentinit” – axe blades. 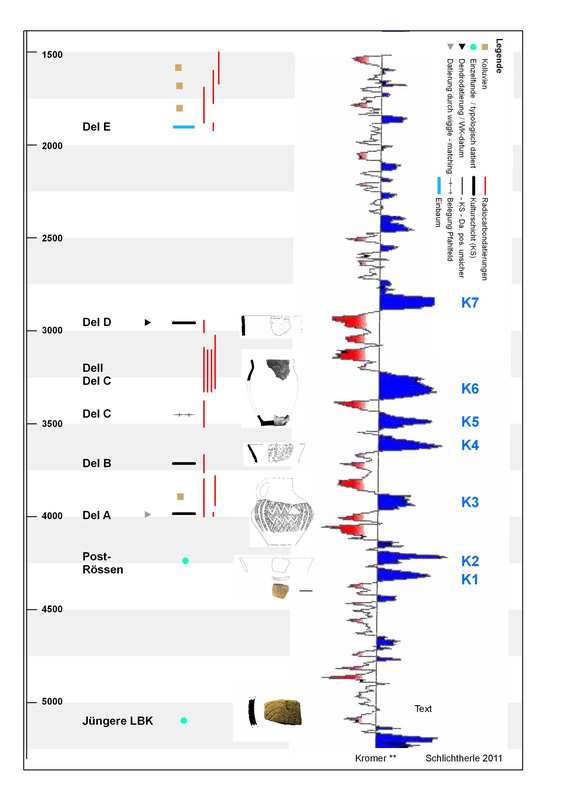 The few materials of DeII allow comparison to inventories of Arbon Bleiche 3 or Sipplingen layer 11 and belong therefore to the chronological transition horizon between Pfyn and Horgen cultures. 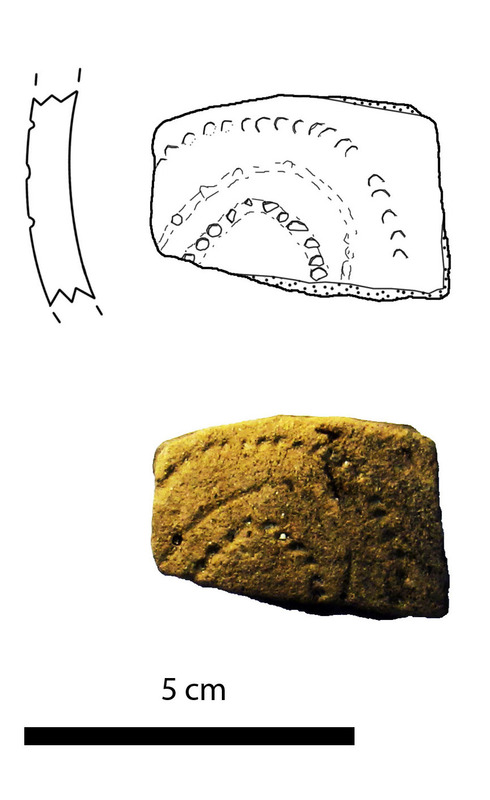 Sherd of the Younger Linear Pottery. Copper pendant, probably part of a bracelet consisting of at least four similar objects. The unstratified material contains a sherd that can be compared to objects of post-Rössen contexts. Four copper pendants are particularly noteworthy. Together with some flint objects of north Italian origin, they prove that the villages at the beginning of the fourth Millennium were linked to wide-spanned trading route networks of their time. Information on settlement structure and architecture can, in first line, be deduced from the pile field of DeI. The most informative evidence has been delivered by DeI A. Piles, that have in almost all cases not been split, but left round, form rows oriented to NNE / SSW. Pile field, resolved to wood species. 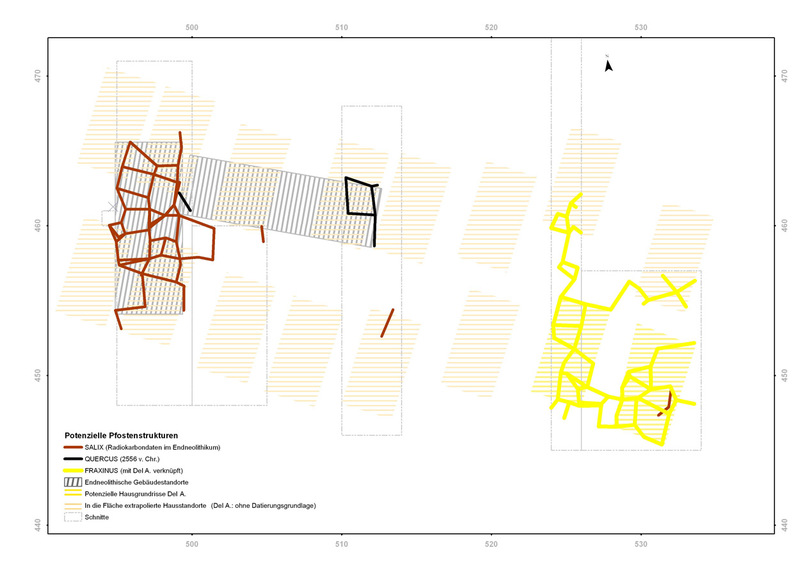 Fig: Archaeological analysis of the pile field, showing a regular structure of ash-built buildings (corresponding with the village of DeI A) and structures of willow and of oak, corresponding to DeI C.
Taking dendrotypological, wood anatomical, and planimetric observations into account, we believe that the pile foundations represent 15 – 20 houses measuring 4.5 to 10m and were built in two rows. 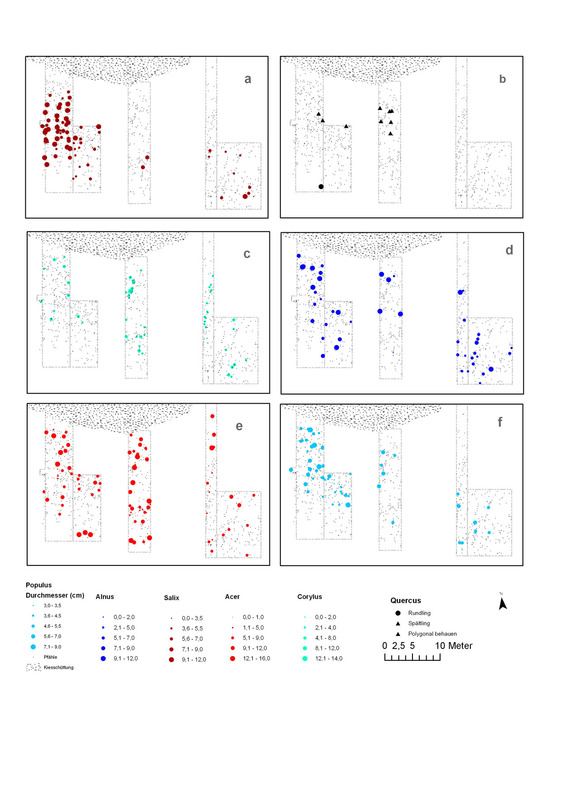 In some cases mapping of artefact groups yielded more results. An ensemble of stone artefacts, for instance, could be connected directly to a building of the 30th century BC. 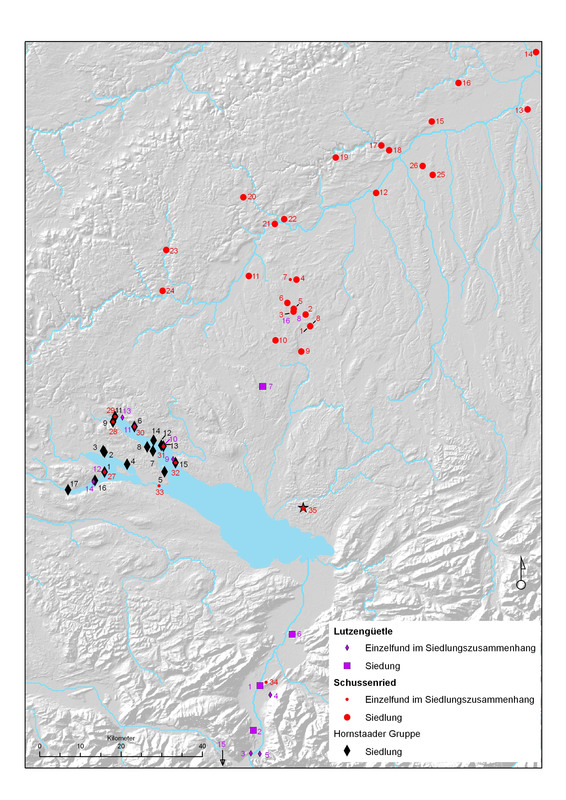 Distribution of the culturals formations in the Lake Constance region at the beginning of the 4th century BC. Degersee relates to number 35. Precise absolute datings, the information on settlement positions and structures, and also typological evidence allow comparison to the adjacent culture areas at western Lake Constance, in Upper Swabia and in the Alpine Rhine Valley. The 40th century occupation at Degersee is culturally linked to the Hornstaader Gruppe, Schussenried, and Lutzengüetle. 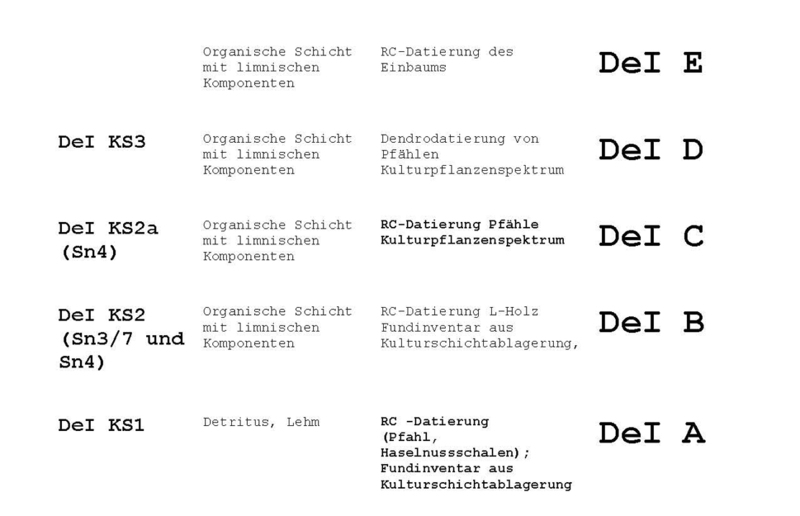 The next occupation, DeI B, reveals similarities to evidence produced by settlements of the Pfyn-Altheimer Gruppe in Upper Swabia and the Mittlere Pfyner Kultur at Lake Constance. 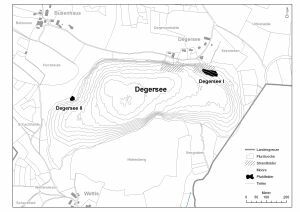 DeI C can be compared to a small number of sites representing the formation processes of the beginning of the Final Neolithic. 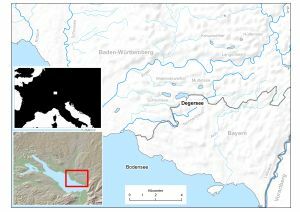 DeI D shares characteristics of Horgen Culture materials, with its distribution across the whole area of eastern Swiss and south-west German pre-alpine forelands. At the same time some peculiarities of the Degersee materials are noticeable. Particularly striking is the complete absence, both in all culture layers and in the unstratified materials, of flint materials of south Bavarian origin and also any other direct evidence of cultural links to the east. Even more surprising is the existence of an Early Neolithic object, which signals, together with an object of post-Rössen context, the presence of farming communities from the 6th millennium BC onwards. This archaeological evidence, the clearly defined outer borders and, in comparison with the adjacent landscapes, high precipitation rates gives the region the character of a settlement cluster with its own cultural imprint which was occupied periodically over long periods of time.